NETWORK UPDATE: THE MYSTERIES OF LAURA, CHICAGO PD and ARROW gained 0.1 in final numbers, while THE 100 lost the same amount. AMERICAN HORROR STORY (FX) lost 0.19 from its Halloween week episode, but still more than doubled the next highest cable rating of the night at 2.11. SOUTH PARK (Comedy Central) followed, up 0.08 to 0.99, and KEY & PEELE gained 0.05 to 0.68. ESPN’s pair of NBA BASKETBALL games were at 0.81/0.66, the late game running ahead of the game in primetime. AMERICAN PICKERS (History) was up almost 50% from last week to 0.59. 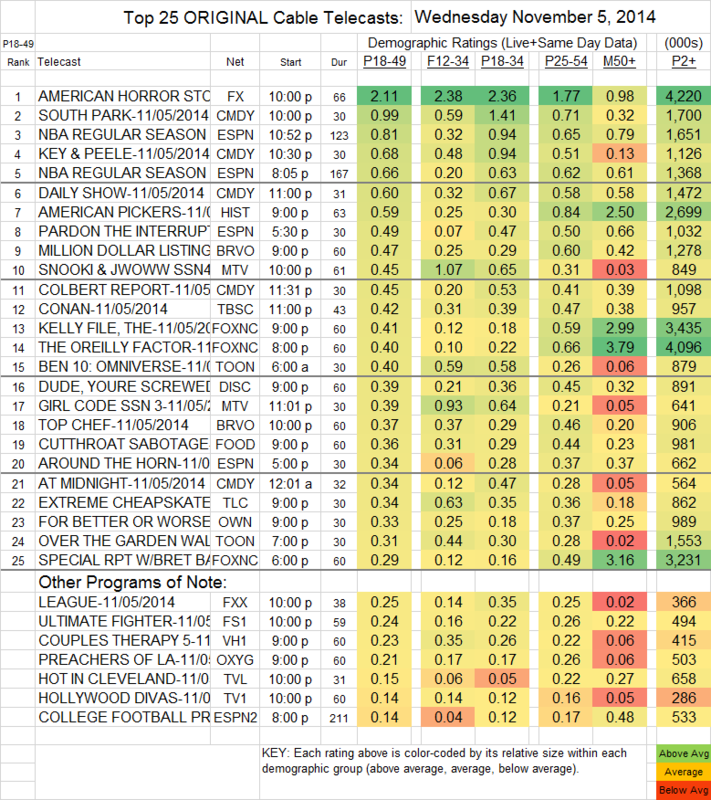 On Bravo, MILLION DOLLAR LISTING and TOP CHEF were at 0.47/0.37, up 0.02/0.01 respectively. MTV’s return of SNOOKI & JWOWW was at 0.45, but at 1.07 in Females 12-34, it was second for the night only to AMERICAN HORROR STORY in that demo. GIRL CODE held its lead-in well at 0.39 (and 0.93 in its demo). FOR BETTER OR WORSE (OWN) lost a tenth to 0.33. THE LEAGUE (FXX) was up a tick to 0.25, and HOT IN CLEVELAND (TV Land) was at 0.15. In response to reader queries: Showtime’s WEB THERAPY was at a barren 0.01 in 18-49s, with a total of 27K viewers. Food Network’s KITCHEN INFERNO was at 0.18/565K. TVLand’s THE EXES was at 0.11/472K. The premiere of BBCAmerica’s THE GAME wsa at 0.025/159K.